Last Saturday morning, I saddled up Lucy Long, put in my Victoria: A Summer Concert in the Park CD and galloped up to Byers Woods, a 130-acre park four miles south of Ashland. The miles flew by as I listened to Sousa marches, selections from The Student Prince, “A Night in June (Serenade),” and the other tracks I’ve loved hearing ever since Victoria magazine released this special compilation of summertime music in 1993. When I arrived at the park that surrounds a capped-off landfill, I felt like I had attended Picnic with the Pops, watched a fireworks display, and listened to a Worthington Concert on the Green. All I needed was a Hills Market cookout and a dish of Graeter’s ice cream to top off my idea of summer fun. As big blobs of guano landed all over Lucy’s windshield and hood, I grabbed my binoculars and joined dozens of other birders for the point of the trip — a walk led by Jim McCormac as part of “Bobolinks at Byers Woods,” an event sponsored by the Greater Mohican Audubon Society and the Ashland County Park District. Meeting Veronica, a teacher from Wooster, and her daughter, Miriam, a 4-H’er who discovered birding in a class for gifted children, was the highlight of the morning. There was a lot more to see on the walk than just Bobolinks, the regionally endangered grassland blackbirds that winter in Argentina. As we traversed trails that passed ponds and pastures, Jim pointed out scores of birds to a list-making Boy Scout and the rest of us. Yellow Warbler, Cedar Waxwing, Eastern Meadowlark, Eastern Kingbird, Baltimore Oriole, Eastern Bluebird, Willow Flycatcher, Goldfinch, Black Swallowtail, Savannah Sparrow, Yellow-breasted Chat, Yellow-throated Vireo, Orchard Oriole, Yellow-billed Cuckoo and the less-common Black-billed Cuckoo were just some of the species we glassed. B irds weren’t all we spotted. Jim made sure that we all saw a Clouded sulfur butterfly, a European skipper butterfly and an Ebony Jewelwing damselfly. He also pointed out Autumn olive, Smooth Beardtongue, Maximilian Sunflower and Tatarian honeysuckle to budding botanists. Seeing birds is good, and learning about them is better, but reading about them in literature is best. So when Jim mentioned that William Cullen Bryant had included Bobolinks in his poem called “Robert of Lincoln,” out came the notebook and I wrote down another “assignment” to work on when I got home. 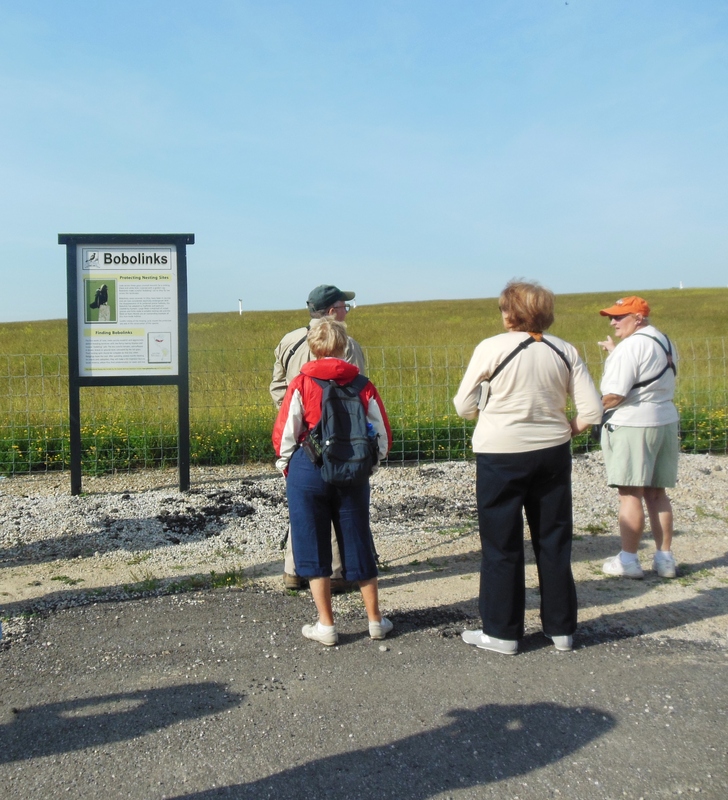 Bryant wasn’t the only one who waxed poetic about those bubbling, gurgling Bobolinks. A LitFinder database search led me to discover that “the gladdest bird that sings and flies” is the subject of the poem “Bobolink” in Bird and Bough, published by American naturalist John Burroughs in 1906. Thomas Hill, president of Antioch College and Harvard University, penned “Bobolink,” a poem about the “endless, gushing mirth” of the bird, in The Household Book of Poetry, edited by Charles A. Dana and published in 1882. Emily Dickinson also liked these birds. “No Bobolink – reverse His Singing” is one of 37 bird poems included in a lovely book called A Spicing of Birds: Poems by Emily Dickinson. This 2010 anthology selected and introduced by Jo Miles Schuman and Joanna Bailey Hodgman is illustrated with works by artist/ornithologists such as Mark Catesby, Alexander Wilson, Thomas Nuttall and some of the earliest bird photographs taken by Cordelia Stanwood. Audubon’s “Wandering Rice-bird [another name for a Bobolink] and Red Maple” is opposite “No Bobolink – reverse His Singing.” Dickinson compares a Bobolink to a chorister in “Some keep the Sabbath going to Church,” which is paired with an illustration of a “Bob-O-Link” by Robert Ridgway, curator of birds at the United States National Museum for over 50 years. Researching ornithologists is also proving to be worthwhile. When Jim spotted a Song Sparrow, he told us that the bird was studied by Margaret Morse Nice, an ornithologist whose husband was on the faculty at Ohio State for a time. There’s an “assignment” in my notebook about her, too. 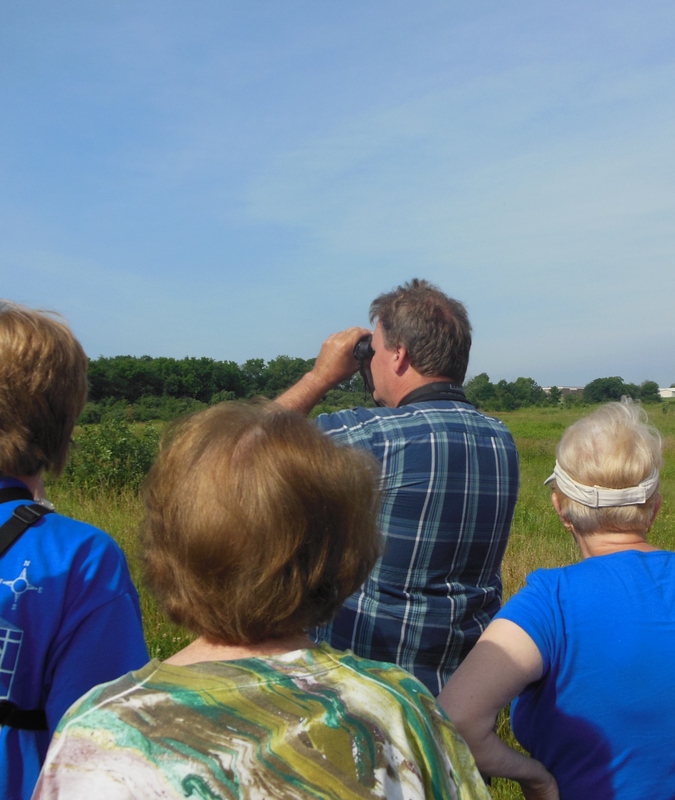 To read our guide’s perspective on the walk — and see a photo of the black, white and gold Bobolink (I was too engrossed to snap one!) — click here. Can you spot the “Bee bird” in the group photo? She may not be as conspicuous, flamboyant or aggressive as her other moniker, the bee-eating Eastern Kingbird, but there she is, with her reddish hair and sunglasses, hiding behind two girls! This entry was posted in Birds, Books, Nature/Outdoors. Bookmark the permalink.